Extending for over 1300 hectares, the Archaeological and Landscape Park of the Valley of the Temples is one of the largest archaeological sites in the world. From a naturalistic and agricultural perspective, the park’s landscape is extraordinarily beautiful and varied, the result of a melting pot of unique natural elements and centuries of human activity. The most prevalent forested areas in the park are the almond and olive groves, while grapevines producing wine grapes populate the more fertile areas. 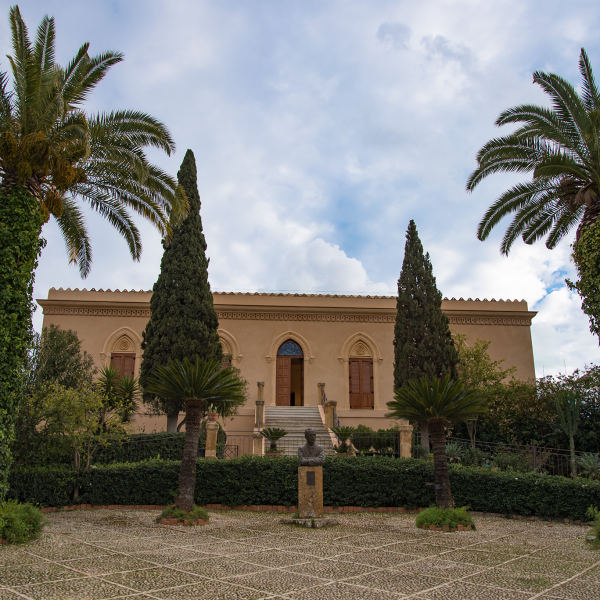 The distinctly Mediterranean maquis of myrtles, carob trees and dwarf palms blends with the monumental remains of the Temples and adorns the red sandstone walls of the park, forming a unique scene of the meeting point between archaeology and landscape. 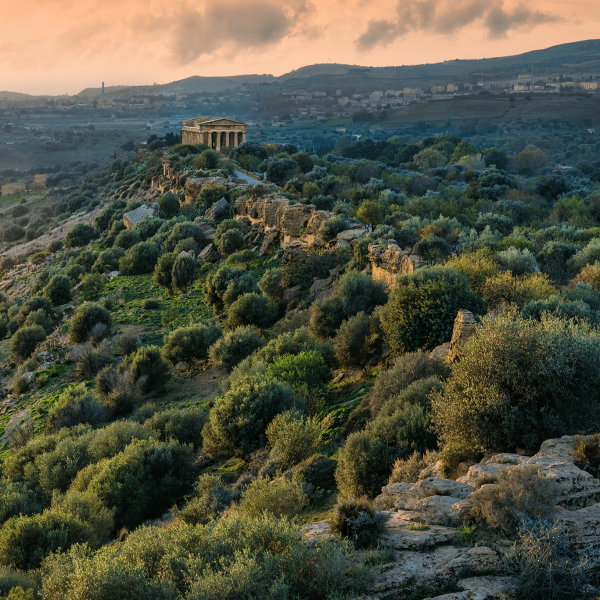 Grapes, olives and wheat were already part of the landscape of the Greek city and over the centuries were joined by species from other countries and continents in a slow process of agricultural diversification. 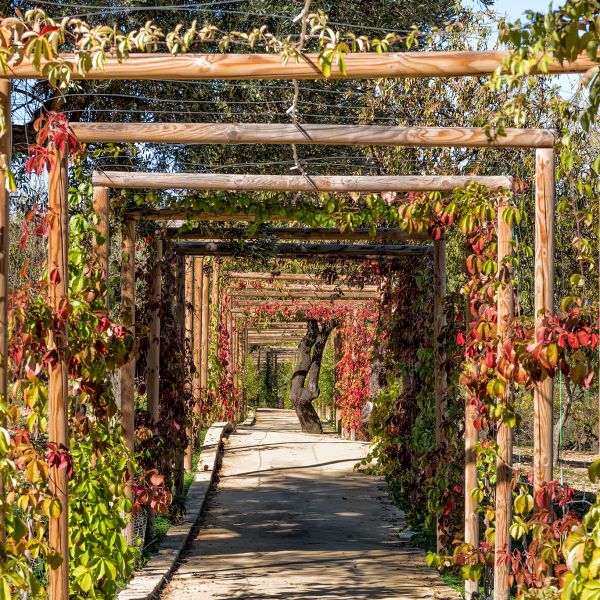 The park now features olives, almonds, vines, pistachios, citrus fruits, domestic figs, prickly pears, fruit trees and ornamental shrubs. Along the rivers and streams, tamarisk, willows and poplars offer shelter from the spring and summer heat, while numerous exotic species have been introduced into the garden of Villa Aurea. 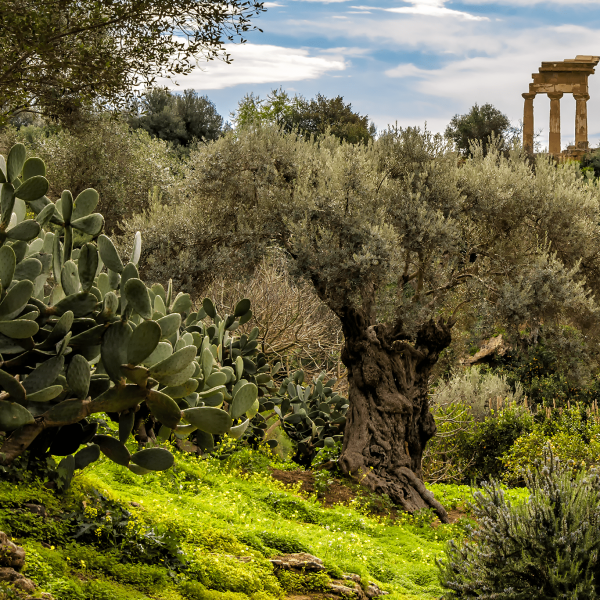 Carob trees, myrtles and huge Saracen olive trees have been documented and catalogued as “Monumental trees” in the book “I grandi alberi di Sicilia: I Patriarchi della Valle dei Templi”. 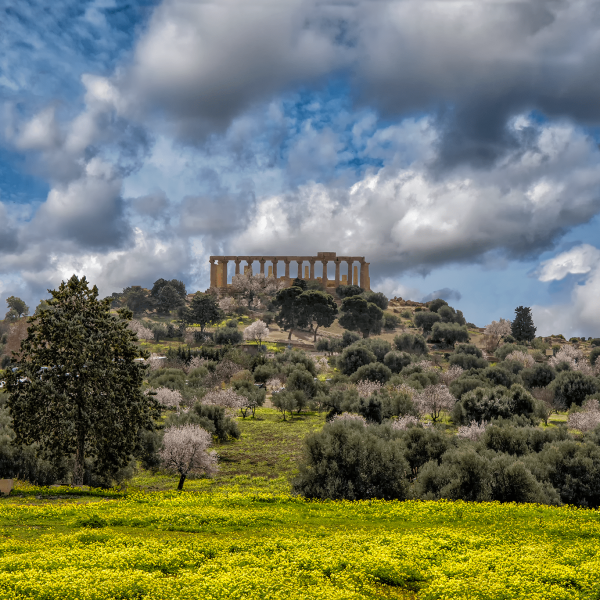 In 1997 the early-flowering almond - already one of Agrigento's main tourist attractions - was put under protection thanks to the creation of the “Living Almond Museum”, an almond grove of around 300 traditional varieties of almond. Today, the park's role includes the protection and promotion of the valley's historic landscape, duties expressed through the implementation of two important projects: the Diodoros project and the Agri Gentium project. The Kolymbethra Garden is a true natural oasis, an ancient artificial pool created according to the wish of the tyrant Theron and later converted into a fertile orchard in the Middle Ages. With the addition of the citruses, the orchard became known as a “garden” in line with the Sicilian naming tradition used to highlight to usefulness and beauty of traditional citrus groves. Today, following a complex series of environmental restoration projects, this precious area has been returned to its former splendour by the FAI (the Italian Foundation for the Environment), which manages the site according to a twenty-five-year licence. 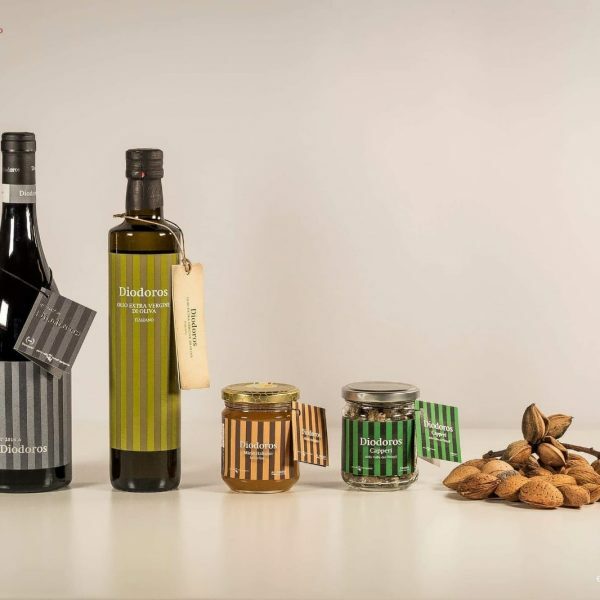 In 2005 the park registered the Diodoros trademark in order to market its agricultural products through partnerships with regional companies boasting the highest quality standards. 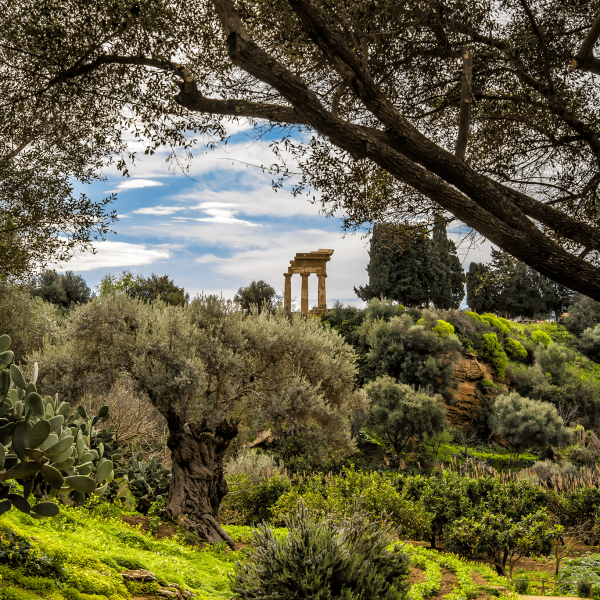 In terms of the park's produce, Diodoros wines and oils are the jewel in the crown, making use of the vineyards and olive groves between the Temple of Hera Lacinia (Juno), the Temple of Concordia and the ruins of ancient Akragas. The Agri Gentium project was designed to grant licences for the state-owned land with three aims: to establish community allotments; to create dedicated agricultural areas to help reintegrate disadvantaged people into the community; and to restore or protect the biodiversity of the region and promote the knowledge of traditional farming practices. In 2017, the “Agri Gentium - Landscape Regeneration” project won the Premio Paesaggio Italiano [Italian Landscape Award] at the very first Giornata del Paesaggio - Landscape Day - organised by the Italian Ministry of Cultural Heritage and Activities, and was nominated as Italy’s entry to the Landscape Award of the Council of Europe 2017-2018, where it earned a special commendation for “the exceptional nature and practice of the measures implemented to promote sustainable development and social reintegration”. 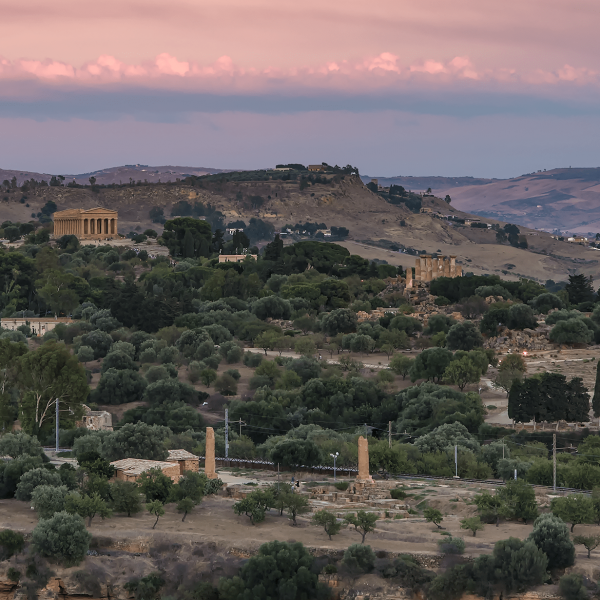 There have been numerous initiatives to promote the protection of the agricultural and natural landscape of the Valley of the Temples with a focus on “environmental, ethical, aesthetic, productive and recreational” themes. When asked, “If you could wish for one thing only, what would that wish be?”, almost everyone - from beauty pageant contestants to politicians, to religious leaders, to children, to the average person on the street - states, “Peace on Earth” or “An end to all wars”. Those wishes, while exemplary, are meaningless. The “Mediterranean maquis” is the characteristic vegetation typical of many of the islands and coastal areas of the Mediterranean, composed of trees and shrubs which, in the course of evolution, have developed a series of strategies to survive the arid summer. Between 1921 and 1932, Villa Aurea was the residence of Sir Alexander Hardcastle, a nobleman and captain of the British army. 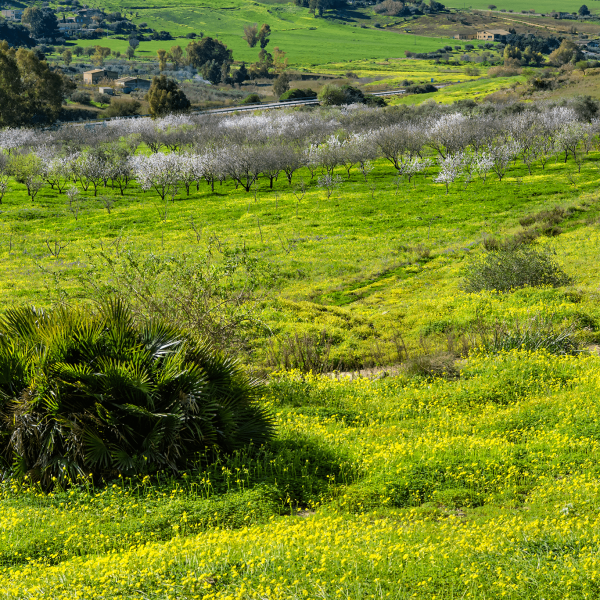 Following an existing path and enhanced with tufa stone paving, the trail delves into the agricultural and natural landscape of the Park of the Valley of the Temples and offers an exploration of the immense natural heritage of the Valley on foot or by bicycle. 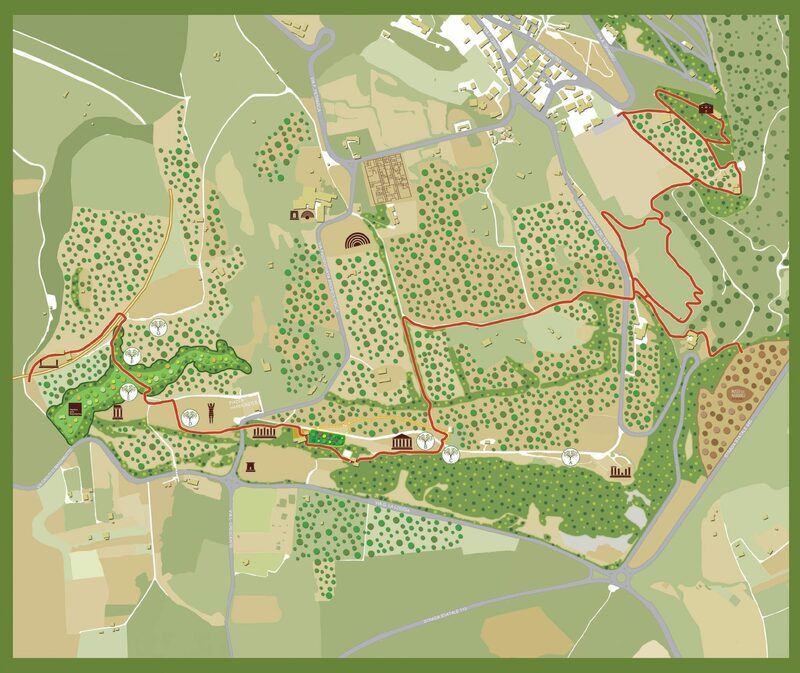 The wellbeing trail was created to develop and promote the quality of the Park's welcome by improving the accessibility and experience of the Park's archaeological itineraries and nature trails.